Overview: Members of the Mystery Shop Forum have frequently asked if it is financially feasible to survive solely on mystery shopping income. Volunteers, who were successfully earning $2,000 or more per month, were solicited and Mystery Shopper Magazine is proud to present the second in a series of interviews on the topic. MSM: Please give us a brief overview of your background prior to mystery shopping and, if you will, discuss what past work experiences have contributed to your success as a mystery shopper. Mr. X: Prior to mystery shopping, I was a gas station attendant and worked in the fast food industry. During this time, I supplemented my income by doing on-line surveys. Being familiar with how these businesses operated, simplified the mystery shopping experience. MSM: How did you first learn of mystery shopping and what was the impetus for you to begin? At what point, did you realize it could become a lucrative venture? Mr. X: I first learned of mystery shopping and focus groups through the paid survey sites. After dabbling in mystery shopping for two years, while continuing to work at my gas station job, I began to notice that I liked it better and realized that if I was willing to invest more time, I could make a living out of it alone. Despite this realization, I only put a moderate effort into mystery shopping for the next three years, making enough to quit my other job, but not enough to live comfortably. At this point, I decided if I really wanted to enjoy my life, I had to commit more effort and time, so I started adding more and more jobs per week. I began identifying the better paying jobs and figuring out ways to minimize the time spent, while maximizing the revenue and still maintaining the quality of the shop. MSM: Monetarily, can you give us an approximation of what you consider a “bad month”, a “good month” and a “banner month”? Do you count “useful reimbursements”, such as gasoline, groceries, etc. when computing your “earnings”? Mr. X: I consider a “bad” month less than $2,000 net profit; an “average” $2,000 to $2,400 net profit; and a “banner” month $3,000 or more. As far as counting useful reimbursements, and I may not be typical, but I count gasoline and toll reimbursements as income. Other things, such as groceries or food and meals, I deem enjoyable but do not consider them income. I also don’t count oil changes, since I get those free, without a shop, at the dealership where I bought my car. MSM: Please describe your average workweek, including number and types of shops, amount of time spent away from home and the time required to report the shops. Mr. X: My workweek varies from week to week, making it difficult to describe an “average” week, however I can say my average pay per job, after expenses, falls somewhere between $15 to $20 an hour. I typically travel two weeks per month, going up to 200 miles in one direction. I do a lot of one and two day trips, where I leave home at noon and return around midnight or stay overnight and return around 6:00PM the following day. For the more distant trips, I add shops when I arrive and sometimes end up staying longer if I am able book enough shops to make it worth the extra expenses. Depending on the assignment, it takes me roughly 30 to 45 minutes to complete a report, although some are real quick and only take five to fifteen minutes and others (rarely) can take from one to two hours. MSM: It would be difficult to generate significant earnings from mystery shopping without a sound strategy. What is yours and what makes it so effective? Mr. X: Since I have no one to answer to and no pets, I am open, depending on the weather, to go anywhere at anytime, if the pay is right. I am always checking my email and willing to book shops whenever I am awake. If there is anything 30 minutes or more away I look for a few shops to book all at once. I know how long the shops take and how many I can realistically do in one day and I make sure to not overbook. After checking my e-mail, I then look at the job boards of the mystery shopping companies from which I get most of my work. I continue by hitting the different job boards, which list jobs for multiple MSCs, such as jobslinger.com, prestomap.com, msjobboard.com, and isecretshop.com. If I still need to fill my schedule, I go to my list of links for all of the MSCs with which I’m registered. I only do this, as needed, not every day. Unless the fee is fair for the amount of work required, I don’t accept jobs at the posted rate, except as a filler or part of a route. I e-mail schedulers or call them and request bonuses, using gas, tolls, tight schedule or whatever as my rationale. If they deny my request, sometimes I wait and try again if the job is still posted the next week or at the end of the month. MSM: How stressful is it maintaining this level of income, month after month? What do you do to keep from getting burned out? Most importantly, how do you maintain order and tranquility in your personal and professional life in spite of an uncertain availability of work and a chaotic schedule? Mr. X: Mystery shopping as your sole income is hard and can be stressful. To manage the stress, I build in days off and take a one to two-week no-shopping vacation each year. I rarely shop on Sundays, however I will make an exception if I am offered a highly paid shop—but I limit it to just that one. I like to do a variety of shops as it keeps things interesting and keeps the stress level down. I also find it is very important not to overload myself with shops as long as I make enough to meet my monthly obligations. Together, this all keeps me from burning out. Since there is always work available and it’s just a matter of finding it and since I design my own schedule, I don’t view the work as “uncertain” or “chaotic”. MSM: What advice do you have for new mystery shoppers and for experienced mystery shoppers, who want to increase their income? 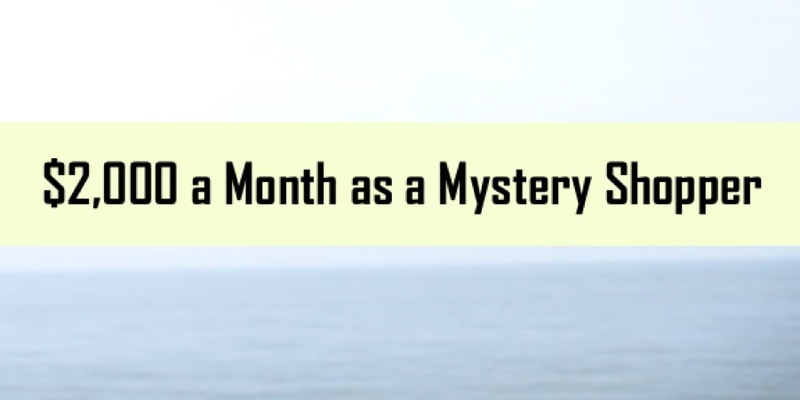 Mr. X: My advice to experienced mystery shoppers, who want to increase their income, is get to know your schedulers and request to be automatically assigned specific shops every month. This helps them and this helps you. For example, I have a set of audits, which I conduct every month. I also suggest continuing to grow your list of MSCs. And look, look, look for shops multiple times per day, throughout the month. In addition, for new shoppers, I’ll add, take a week off and spend each day applying to mystery shopping companies. Try a wide range of different shops, a few times each, so you can discover which ones are worth it and which ones are not. For all shoppers, I advise that you don’t do shops at low rates, where you lose money or make less than minimum wage. If no one takes the low paying shops, the MSCs will be forced to pay a decent wage, which, in the long run, benefits all shoppers. MSM: Thank you for taking the time to share your knowledge and tried-and-true advice with fellow shoppers.